Proper fueling for a thru-hiker is an art form. It’s a balance of finding the foods your body is craving, consuming nutritionally dense foods, and really just getting enough to eat. Food is great motivation, especially when your stomach feels like a bottomless pit. I’ve spent hours on trail daydreaming about my first meal in town and have felt myself hike just a bit faster knowing a hot meal was near. Despite eating nothing but sugar-loaded food, I still managed to drop close to 15 pounds on my trek. The foods I craved changed from day to day and section by section. When hiker hunger was hitting especially hard, I would create a list of foods I dreamed of to purchase in town. Powdered doughnuts were on this list so frequently that my phone would immediately autocorrect doughnuts as the word following powdered. And back in the desert, I ate so much Nutella that my trail name was almost Nutella. As my time on the trail progressed, my cravings evolved. All I wanted in the desert was an ice cold root beer and a bag of chips. The Sierra was soft-serve ice cream and milkshakes. In NorCal, I couldn’t get Zebra Cakes out of my mind after being let down by a broken vending machine near the trail. Oregon brought about cravings of cornbread and cheap Chinese food, and by the time I got to Washington, all I wanted was hot drinks. The ever-changing cravings made me happy that I didn’t plan out my resupply too far in advanced. In fact, I only sent myself six resupply packages and only two of them were made before leaving for the trail. 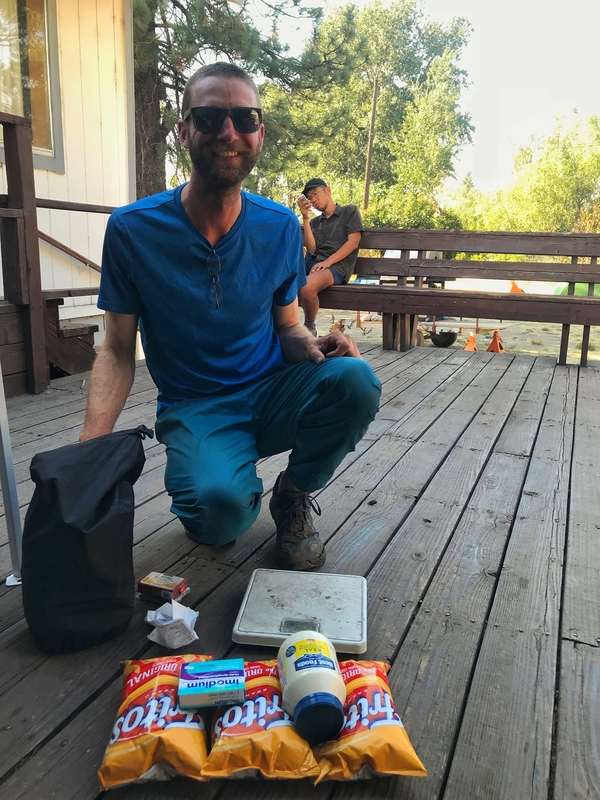 My vision during my preparation for the PCT was to dehydrate vegetables and meat and send packages frequently. When life was hectic this past winter, planning for this adventure was put on the back burner and I felt as though I was scrambling to get ready in time. Luckily, this worked in my favor. I remember entering my first resupply town on trail—Warner Springs at mile 109.5. The day before, I hiked my longest day (so far) of 23.8 miles. In the process, I ate all of my snacks. With less than eight miles to hike and bonking fast, I rolled into town in search of anything to eat. The volunteer system in Warner Springs was absolutely incredible and within minutes of my arrival, a man offered to drive me and three other dirty hikers to the only restaurant in town. When we arrived at 10 a.m., each of us ordered beers and our first real meal in six days. My stomach was growling so loud that I ordered two separate breakfasts and proceeded to inhale everything on my plates. More hikers rolled in and the kitchen was transitioning to lunch. Our neighboring table had a massive pizza delivered and soon all of us were chowing down on our own pizza. It was a relief to crawl onto my sleeping pad and nap off the food coma. Each stop in town was similar to Warner Springs. I enjoyed dreaming of food, but often it drove me crazy. On long and hot stretches of the desert, I envisioned ice cold beverages around every corner and felt let down when there was nothing there. At Cajon Pass (mile 342), my friend Bogey and I hiked through the heat of the day to get to McDonald’s in time for dinner. The entire day leading up to our grease-filled binge was motivated purely on an ice cold root beer, and my first and likely last Big Mac. 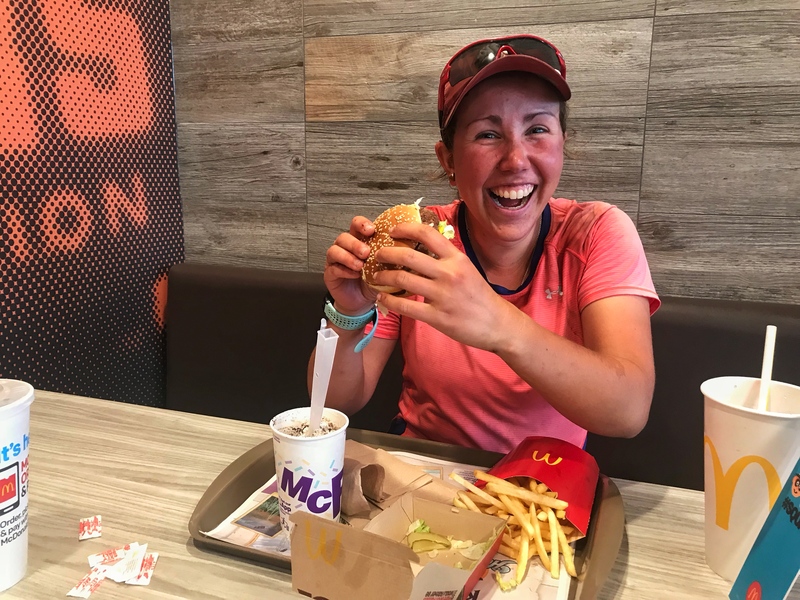 My diet day to day on trail was pretty consistent and I quickly learned that I needed to eat constantly to try to get enough calories. Food is heavy, though. Balancing enough food to control a ravenous appetite and finding lightweight nutrient-dense options was a challenge. Some towns were easier to resupply in than others. Walking into a full-service grocery store was always overwhelming, with the endless possibilities versus the bare shelves of gas stations. Eventually, I fell into a rhythm and an eating schedule that worked for me. -Nutella and pretzels or just more pretzels, or just spoonfuls of Nutella—choose your own adventure! -Mac and cheese, ramen, couscous, potatoes with bacon bits, anything really! Clearly, it’s a miracle that I didn’t develop diabetes along the PCT. Like Buddy the Elf, sugar was a very important food group for my success on trail. There were some times when excess amounts of sugar were not in my best interest. Stehekin, a tiny town on the edge of the North Cascades National Park, was my last resupply point on trail. This quaint little town is also known for an incredible bakery along the shuttle route from the trailhead. Now, the shuttle only stops at the bakery for ten minutes before proceeding to town, so the pressure was on to make good decisions for my final resupply. I ended up spending $60 on baked goods, including two stuffed croissants, a slice of coffee cake, a cupcake (because that packs out well…), and four cinnamon rolls (yes, four). The rest of my resupply included candy bars and a couple packs of ramen. Clearly this sugar high was going to flop at some point. And let me tell you, I crashed and burned. On my last full day on trail, I set a new personal best for distance of 41.6 miles. Despite the fatigue, I was ready to feel like Wonder Woman and dominate the last 26 miles to Manning Park. That was not the case. On the final climb to the top of Woody Pass, I began feeling nauseous and jittery. My body was craving salt, but all I had was sugar. Despite feeling terrible, I willed myself to keep going, knowing that the finish was so close. When I arrived at the terminus, I cracked a celebratory beer and realized the only snack I had was a cinnamon roll. Who knew I would be so disappointed! 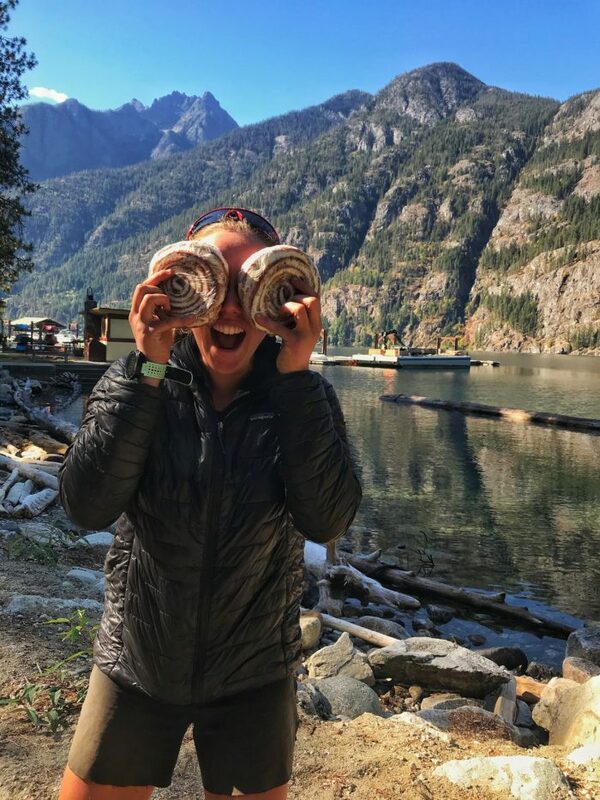 As delicious as those cinnamon rolls were from the bakery in Stehekin, I don’t think I’ll ever be able to eat one again. Beef ramen is another food that I will never be able to eat again. This debacle started in the tiny town of Castella, CA, which is literally a gas station and a post office. Since I was traveling just days behind the main bubble of hikers, the shelves of the gas station were bare. I had run out of fuel as well. All that was left was beef ramen and candy bars. Etna, the next town on trail, could not come sooner! Now, my friend Bogey also may never eat Fritos and mayonnaise ever again. From the start, he spent a lot of time joking about ways to become an ultralight backpacker. By the time he got to Canada he was planning to just have a trowel and a rain jacket in his pack. And for food, he would have a bag of Fritos and a jar of mayonnaise. In NorCal, he decided to test this absurd combination. Luckily it was a short stretch with a lot of trail magic in between. Every time we stopped for breaks, I would have to turn away as he spooned Mayo out of the jar and sprinkled Fritos on top. But he did it, and decided to stick with his regular system for the rest of the trail. It should also be noted that the last day of this challenge was his birthday—you’re a trooper, Bogey! The guys I hiked a majority of the trail with had a joke of “putting up numbers.” Now, this doesn’t mean logging insanely high-mileage days; we were talking about eating insane amounts of calories. I was the lightweight of the group, but I was hiking with four human vacuums, so no food went to waste. One of my proudest performances came at the Timberline Lodge at the base of Mount Hood in Oregon. This was by far the best buffet I have ever been to, so good in fact that I went to the lunch and the breakfast buffet over the span of 24 hours. Each time I put down roughly five plates of food. Soon after, I engaged in my most hiker trash of behavior in Cascade Locks, the last town in Oregon. There is a drive-in known for massive ice cream cones. Of course I had to have one. With confidence, I ordered this beast of a treat and received it with steady hands. Six inches of ice cream on a tiny cone really defies the laws of physics, so naturally after my first bite all of the ice cream fell to the ground. Disappointed, I knew I wasn’t going to let this delicious ice cream go to waste. So like any good hiker trash, I got on my hands and knees and licked the ice cream off the ground. The woman at the drive-in took pity on my situation and gave me a new cone with a cup this time. Clearly I hadn’t learned from my previous mistake to just put the ice cream in the cup. History repeated itself and I ended up with ice cream everywhere. This time I knew I wasn’t about to get a third cone, so I picked up the ice cream from my lap, put it in the cup, and devoured it. There were definitely times of gluttony, but there were also times of stretching my food supply. Luckily, there was only one time when I rolled into town with absolutely no food and a voracious appetite. This stretch was a six-day carry from Bishop to Mammoth, CA, roughly 115 miles of massive elevation changes, snow travel, and deep river fords. At this time I was hiking with another young woman named Blueberry, and hiker hunger hit both of us hard. When we left Kearsarge Pass we each had a second food bag because we couldn’t find the space in our bear cans for everything. By day four, we knew our food was going to be a stretch. I remember eating my double dinners every night and still falling asleep with a growling stomach. The perk of this section is the JMT hikers heading in the opposite direction. Two middle-aged men took pity on us as they made their last few miles to Muir Ranch, a fancy and expensive resupply stop close to the trail. Each of them emptied the remaining contents of their bear cans into my pack. I nearly ran up the next pass to tell Blueberry the good news. We cut our day short and camped at a lake to binge on our new treats. There were some other hikers at our campsite also experiencing insane amounts of hiker hunger, so we shared the bag with eight servings of pasta primavera. By day five of this carry, I was literally counting down the hours until breakfast in town. When that morning finally came, I was out of my sleeping bag in an instant. 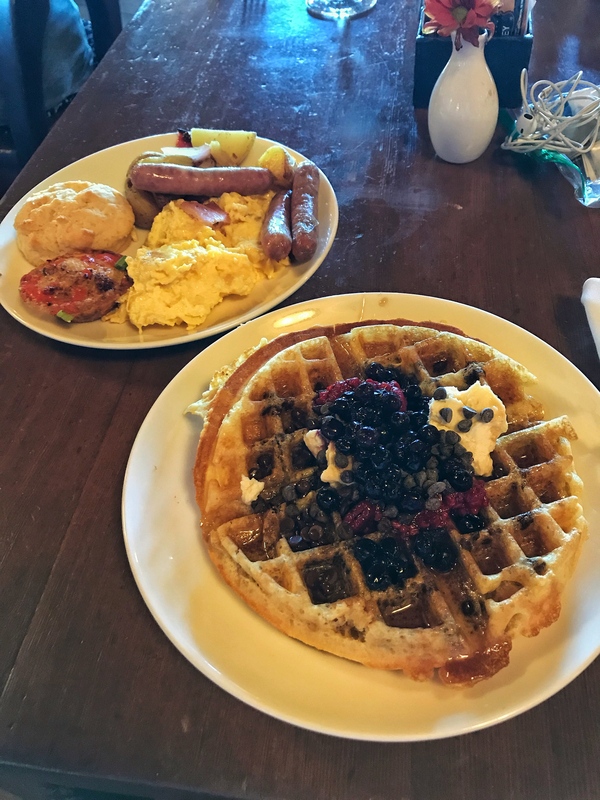 That day, I literally ate my way through Mammoth. Before even leaving the trail, I had a full breakfast at Red’s Meadow. When we arrived in town an hour later, I had a second breakfast, followed by a smoothie and a cookie, and then a burrito, a pint of ice cream, and two bagels. I was incapacitated after that. But the next morning I slammed another huge breakfast before hitting the trail once again. This time with five days of food for a two-day resupply. The other notable time I nearly ran out of food was coming into Bend, OR. I was particularly excited for this stop because I have worked in the area and I was meeting up with some coworkers. Being the stubborn person I am, I skipped a resupply point between Crater Lake and Santiam Pass. I went three days eating nothing but couscous and hiking 35 miles a day. Eight miles out from the trailhead, I found a king-size Snickers bar on the trail, fully intact. I cried tears of happiness and devoured the melted glob. A Snickers bar has never tasted so good. When I finally arrived at the trailhead, a man offered me a Coors Light as I waited for my friend to pick me up. One light beer later, I was wasted. I couldn’t even walk in a straight line to get to my friend’s car. One light beer, couscous, and extreme exertion clearly don’t mix! But my friend Sam brought me a sandwich and I was a functioning person in five minutes. As I reflect on my time on trail, I am continually amazed by the things I ate and the enormous quantities. I remember eating a stack of pancakes with a fat slice of butter, syrup, strawberries, a whole avocado, and several scoops of ice cream. Who eats that? 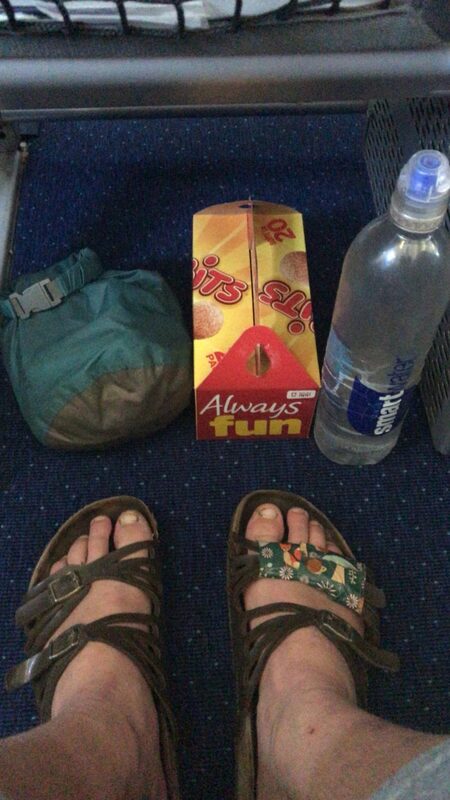 And when I flew home from Vancouver, I brought a small dry bag, a filthy Smartwater bottle, and a box of Tim Bits onto to plane. Talk about hiker trash at its finest! 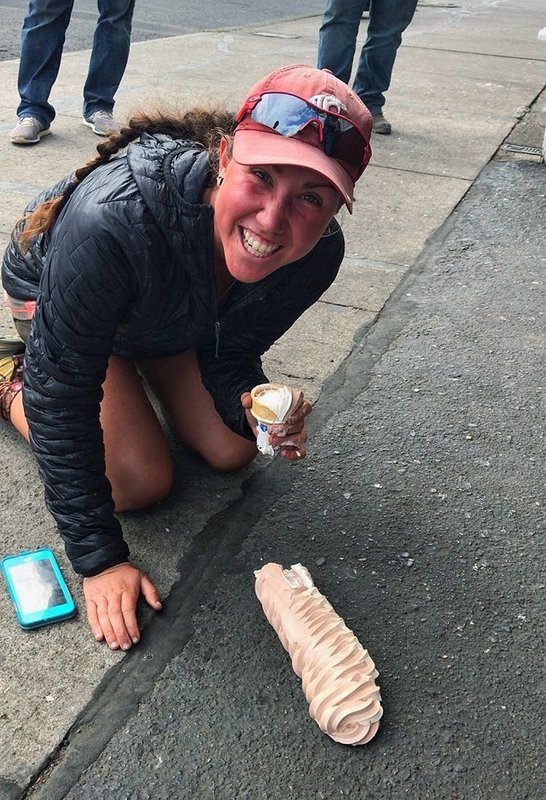 Fueling a 2,650 mile trek on foot is not easy. My perspective on food may never be the same again. One of the main things I have to remember in the front country is that food on the ground is not free food. In my first week back from the trail, I walked past a pile of ripe raspberries on the ground on the USC campus. The amount of willpower it took not to eat them was intense. Who knows if I’ll ever be able to put up some impressive numbers like I did on the PCT. I guess I’ll just have to thru-hike again to find out! 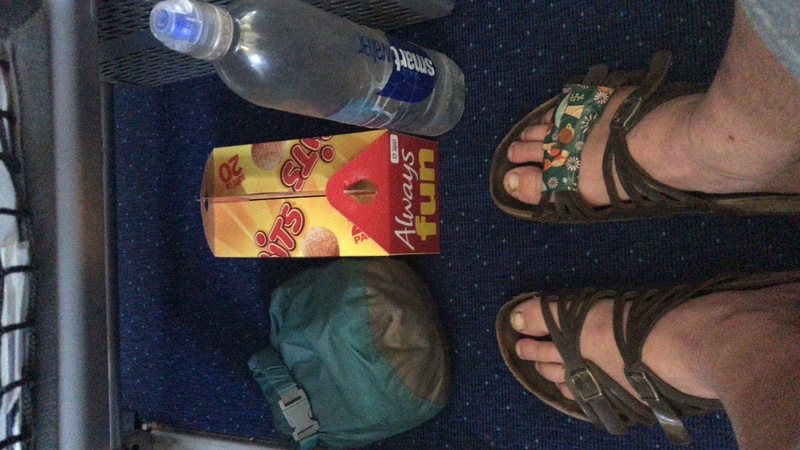 Love this post, had no idea such a compact person could put away that many calories! Always fun to read about trail scarfing. Thanks for all you shared. Quite a nice write-up, I must say!! This was an amazing article!! I loved every, hilarious line. Your info was so helpful as well as amusing. Reading this made me extremely excited for the summer so I can go backpacking again and cry with happiness at the sight of Dairy Queen.